Check out our food recycling videos. Many companies generate food waste daily. Food manufacturers, hospitals, universities, schools and restaurants are often the biggest generators of food waste. 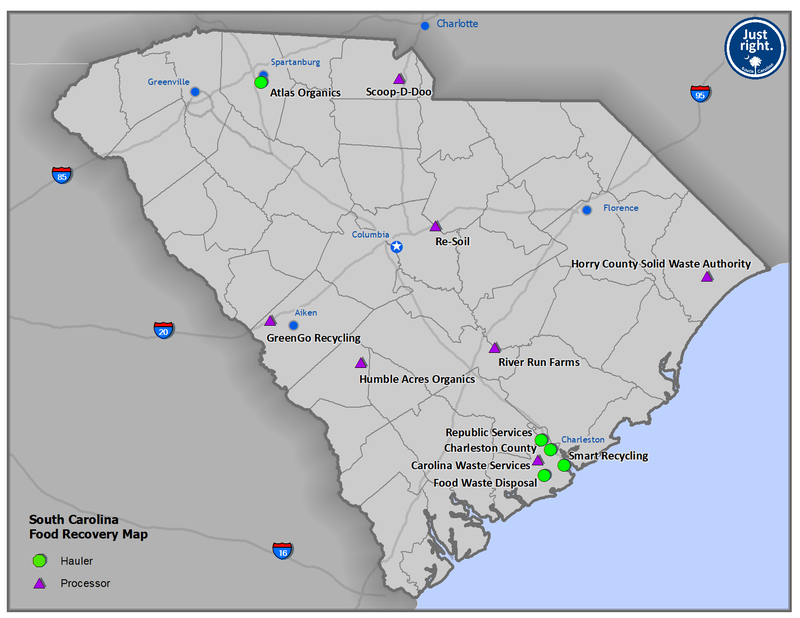 The good news is that businesses in SC have access to four industrial scale food composting facilities in Greenville, Columbia, Myrtle Beach and Charleston, as well as an anaerobic digester in Charlotte, NC. Companies can contract with haulers that collect food waste and take it to compost facilities for processing. To help prevent food waste, business can order just-in-time catered food and consider donating unspoiled food to local shelters. Food/organic waste recycling is a new market for SC’s recycling industry. Food recycling, also known as composting, is a monitored process where food waste and organic matter breaks down to produce a nutrient rich soil amendment that can be applied for use in agricultural, landscaping, home gardening, erosion control and other areas. Don’t Waste Food SC is a collaborative campaign to reduce food waste by 50% by 2030 in SC with the message of “Prevent. Donate. Compost.” The campaign partners with SC Commerce and SC DHEC to lead efforts across the state and encourages public, private and non-profit participants to share knowledge, coordinate resources and work together to help reduce food waste in South Carolina. These simple practices will allow our resources to feed people in need, creating products and energy, as well as diverting material from landfills and creating jobs.